It’s baby bison time at Fermilab! Fermilab offers several annual traditions for our neighbors, from our Family Open House to our STEM Career Expo. But none are quite as anticipated as the birth of the year’s first baby bison. 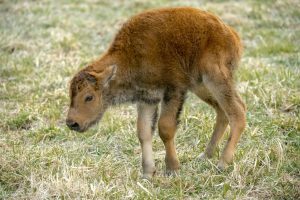 On Wednesday, April 18, baby bison season officially began. The first calf of the year was born in the early morning hours, with a second appearing before noon. The first two baby bison calves are healthy and keeping up with their mothers, walking and nursing. Fermilab is expecting between 10 and 14 new calves this spring, and all of our neighbors are welcome to come on site to visit with and photograph the newborns. (They are always a hit with young children.) The Fermilab site is open every day from 8 a.m. to 8 p.m., and admission is free. You’ll need a valid photo ID to enter the site. And thanks to the science of genetic testing, Fermilab’s ecologist confirmed that the laboratory’s herd shows no evidence of cattle gene mixing. Farmers during the early settlement era would breed bison with cattle in an attempt to create more tame bison or more hardy cattle. A herd of bison is a natural fit for a natural laboratory. Fermilab hosts nearly 1,000 acres of reconstructed tallgrass prairie, as well as remnant oak savannas, marshes and forests. While you’re at the Fermilab site visiting the bison, you can learn more about our ecological efforts by hiking the Interpretive Prairie Trail, a half-mile-long trail located near the Pine Street entrance in Batavia. The Lederman Science Center also offers exhibits on the prairie and hands-on physics displays. The Lederman Center hours are Monday-Friday from 8:30 a.m. to 4:30 p.m. and Saturdays from 9 a.m. to 3 p.m. And the 15th floor of Wilson Hall is open to the public Monday-Friday from 8 am to 4:30 p.m. and Saturdays and Sundays from 9 a.m. to 3 p.m.
For up-to-date information for visitors, please visit www.fnal.gov or call 630-840-3351. 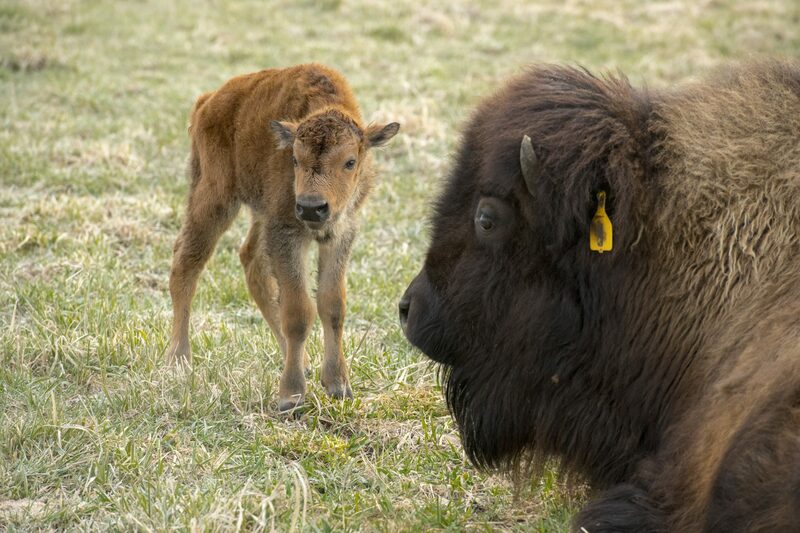 To learn more about Fermilab’s bison herd, please visit the wildlife area of our website.